Amazing Wadia Digital to Anaolg Convertor review and Sale! The brand new Wadia di322 digital audio decoder received an amazing review from senior editor Jeff Fritz of SoundStage! Ultra magazine. The di322 adopts a couple of Apple-ish design cues on the outside, such as the illuminated Wadia logo and screwless rounded case. The chassis is made of die-cast aluminum and weighs 25 lbs! There are 5 Digital inputs (2 optical Toslink, 2 coaxial RCA, 1 USB Type B), and both RCA and Balanced analogue outputs, ensuring that the Wadia DAC is compatible with virtually every system. All connectors are chassis-mounted so that repeated connecting/disconnecting will not break the receptacles. "It took me all of about ten seconds to realize that the di322 sounded fuller and warmer than the DAC that had preceded it in my system, the Exogal Comet...I was shocked at the weight of the piano notes I was hearing -- the sound became as substantial as the massive di322 itself. Seemingly because of this weight, the soundstage expanded to the point where it was bigger than the room -- the piano’s lower registers created as much room lock as if I’d added a perfectly integrated subwoofer to a bass-shy speaker system. The piano was powerfully present in my room, deep and resonant, and the Music Vault’s walls seemed to melt away. .. the louder I played the track, the more emotionally dense the words became. The di322 displayed impressive dynamic range, allowing “Hello” to reach its full majesty, and therefore the emotion was able to punch through. The sound never became harsh or strident, and was as grain-free as I could wish for. Just beautiful. I didn’t know what to expect from the Wadia di322 when I scheduled it for review, but I’m sure glad I did. I’m very pleasantly surprised at just how much enthusiasm I have for this DAC. I enjoyed its rugged yet elegant build quality, appreciating the way this $3500 DAC looked while sitting next to a $65,000 Soulution 711 stereo amplifier: right at home. The Wadia’s physical presence will bring its owner a pride of ownership that eclipses that produced by its more utilitarian competition. Its operation while in my system was also flawless -- I never had a second’s problem with any aspect of the Wadia’s functionality or ergonomics. But the di322 wasn’t just a pretty face with nothing behind it. Its sound was full, big, and played deep -- deep bass, deep soundstage, wide dynamic range. It relished music that I like to play at high volumes with fist-pumping verve. Ultimately, the di322 was a superfun product to have in my system. I always enjoyed physically interacting with it, and, more important, interacting with my music as played through it. For $5,075 bucks (CDN), what’s not to like about any of that? Some audiophiles spend multiples of that amount and don’t get as much. You’ll get your money’s worth here, and then some"
The Wadia 322 supercedes the 321 and differs mainly in that the 321 does not decode DSD. Otherwise, the 321 is virtually identical in its features and sound; top of the line ESS Saber chip run in true balanced configuration, can decode virtually every high resolution PCM file, and able to drive almost any power amplifier directly without a preamp. It also has a headphone jack. It even looks the same as the 322! The Wadia 321 DAC is normally $4,350. We are selling them for $2,599 while stock lasts. 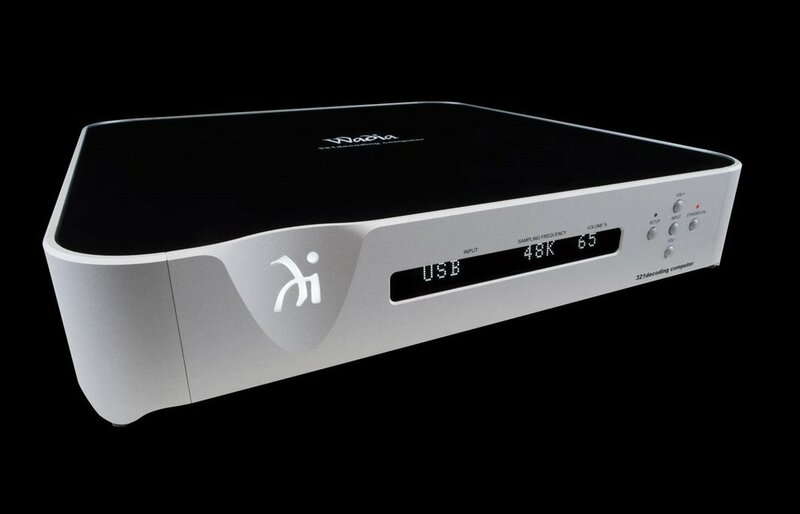 This is your opportunity to get a world class DAC for a fraction of the normal selling price! Remember, this deal only lasts until our stock runs out, and we only have a few pieces left. Once they are gone, the deal is over! Call us for an audition today. I promise you will be very glad you did!